Active filter design software for lowpass, highpass, bandpass and bandstop electronic filters using resistors, capacitors and op amps. 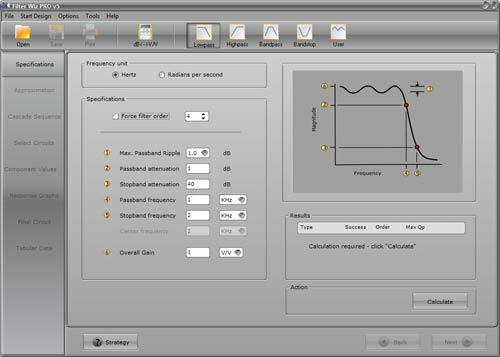 Filter Wiz PRO provides Butterworth, Chebyshev, Elliptic and Bessel Approximations to order 20, with a variety of circuit choices. find suitable op amp families by sorting on GBW, slew rate or quiescent supply current.Version 5 works best with 1024x768 screen resolution or higher. - now you can visually compare all available approximations to find not only which are All-Pole, and which have (more complex) notch stages, but also quickly find those Approximations with both low Filter Order and low Maximum Q (thus providing greater filter stability). Qweas is providing links to Filter Wiz PRO 5.44 as a courtesy, and makes no representations regarding Filter Wiz PRO or any other applications or any information related thereto. Any questions, complaints or claims regarding this application Filter Wiz PRO 5.44 must be directed to the appropriate software vendor. You may click the publisher link of Filter Wiz PRO on the top of this page to get more details about the vendor.